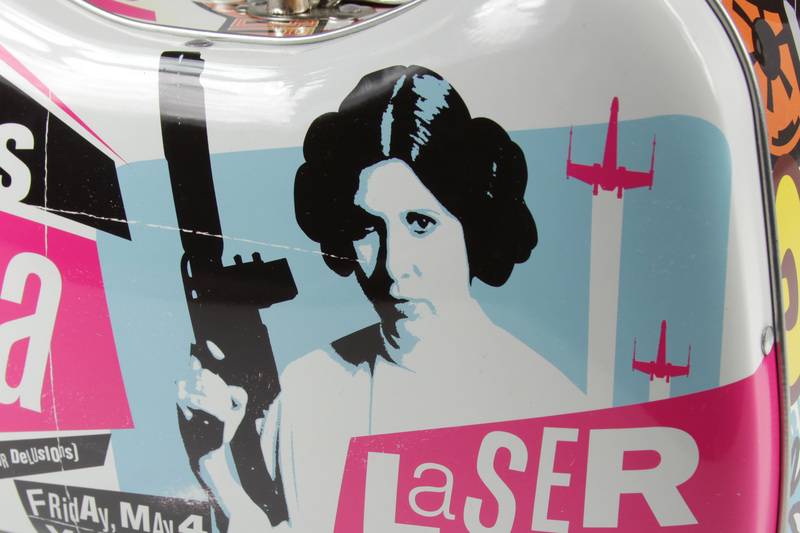 Today’s review features the Star Wars Princess Leia tin purse by The Tin Box Company. 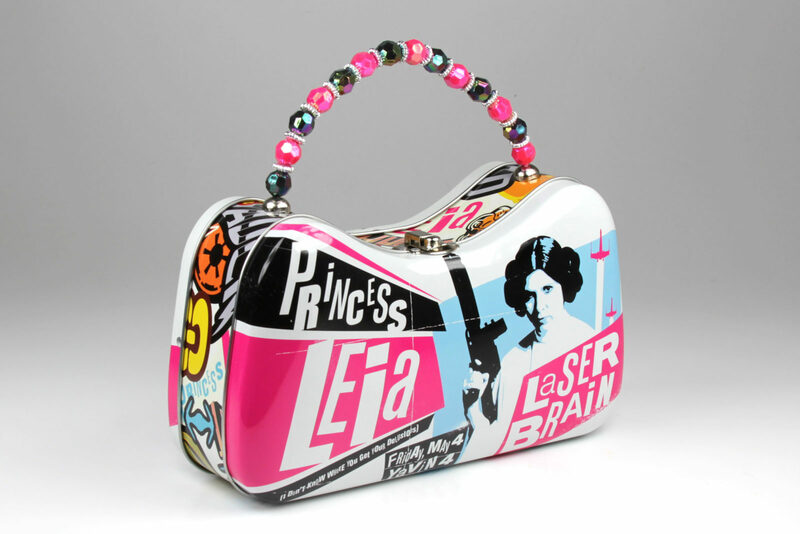 I am always on the look-out for fun and interesting Princess Leia fashion and accessories, so this bright tin purse caught my eye straight away. Officially licensed Star Wars product featuring Princess Leia! 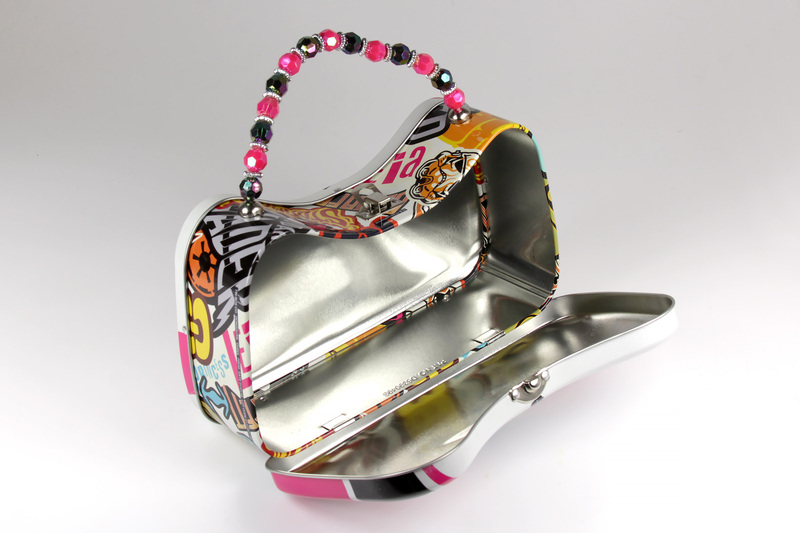 Has a beaded handle, metal latch, scoop shaped design steel tin purse. Can be used as a carry-all, small purse, snack box, and more! Measures 8.5 x 5 x 3 inches. The purse is priced from US$8.00 to US$12.99 each – shipping rates/polices vary by seller (international customers can order via a US mail fowarding service). 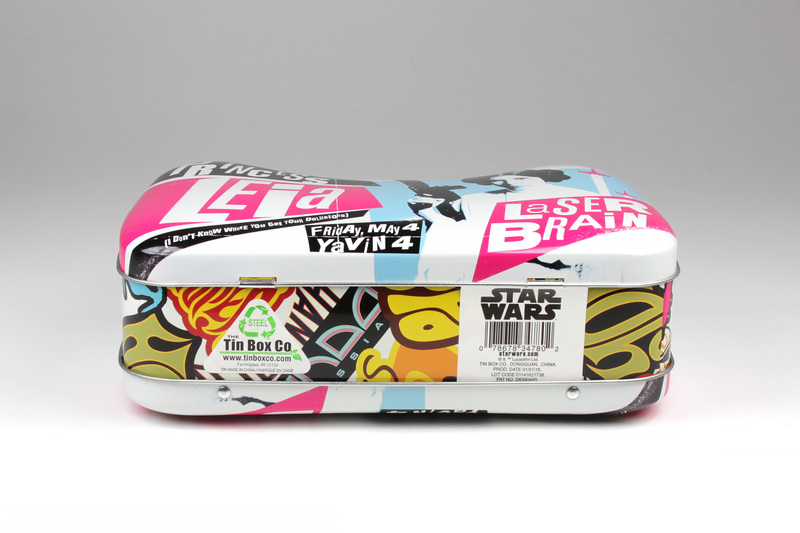 Made by The Tin Box Company, this scooped tin purse features an all-over Princess Leia themed print. 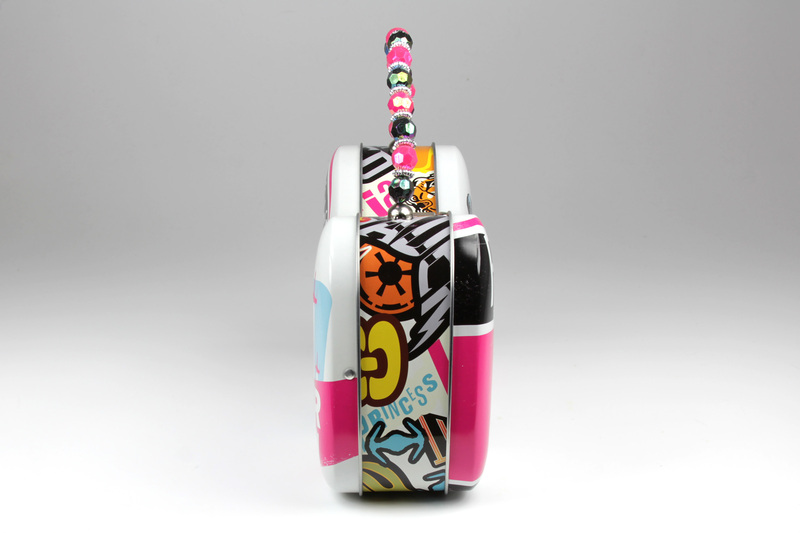 The purse has a bright pink colour scheme, which I love – I know some fans aren’t fond of the use of pink in Star Wars fashion, but it works well with the bold ‘groovy’ print design. I have seen this artwork used on other licensed Star Wars items, like this women’s customisable top at Shop Disney. 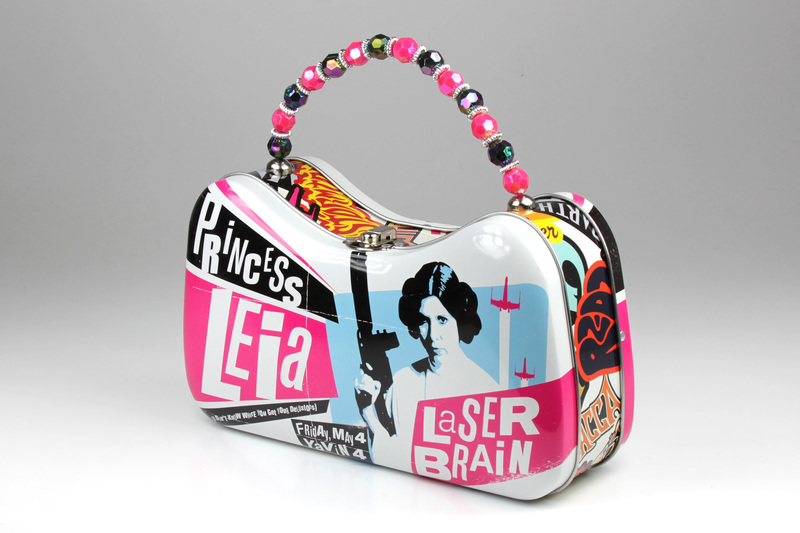 The front and back of the purse are the same – they both feature artwork of Princess Leia, which has scrapbook-style lettering, in a layout resembling an event poster. The artwork includes the Princess Leia quote ‘I Don’t Know Where You Get Your Delusions Laser Brain‘, as well as a time and location, as if advertising an event – ‘Friday, May 4, Yavin 4‘. 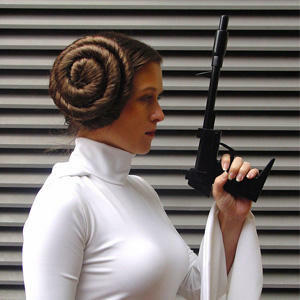 The Leia artwork is based on a promotional photo of Carrie Fisher as Princess Leia for A New Hope. I really like that the artwork is the same front and back – a handheld purse tends to be more visible on both sides, compared to a crossbody or handbag worn on the shoulder resting against your side. One of my concerns about tin purses – the risk of scratching the design. The artwork used for this purse actually has ‘scratched’ lines and patches of fake wear already in the print, so real scratches are far less likely to ruin the overall look. I haven’t tested this purse out on a rough surface to see how well the print holds up – but this is obviously not an ‘everyday’ handbag. This design is better suited for selected occasions, so the risk of damage is less than for a bag you would use everyday for carrying all your essentials. The handle is made from wire, threaded through colourful beads. 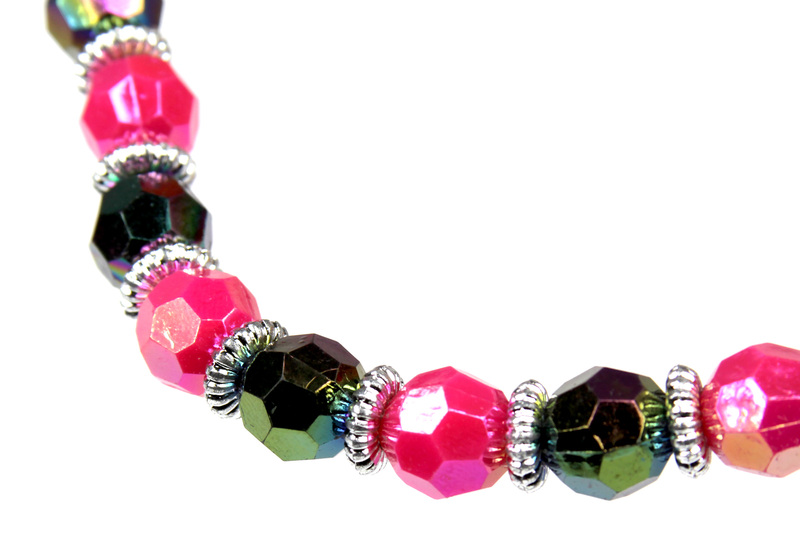 There are three different styles of beads used, in a repeating pattern – a faceted pink bead, a faceted iridescent bead, and silver-toned spacer beads. The wire is not a fixed shape, it can be moved/bent so it molds to your hands a little when carrying. I was curious how holding onto chunky beads would feel, but it is surprisingly comfortable. I can easily hold the handle with heaps of clearance, or even wear it hanging on my wrist. 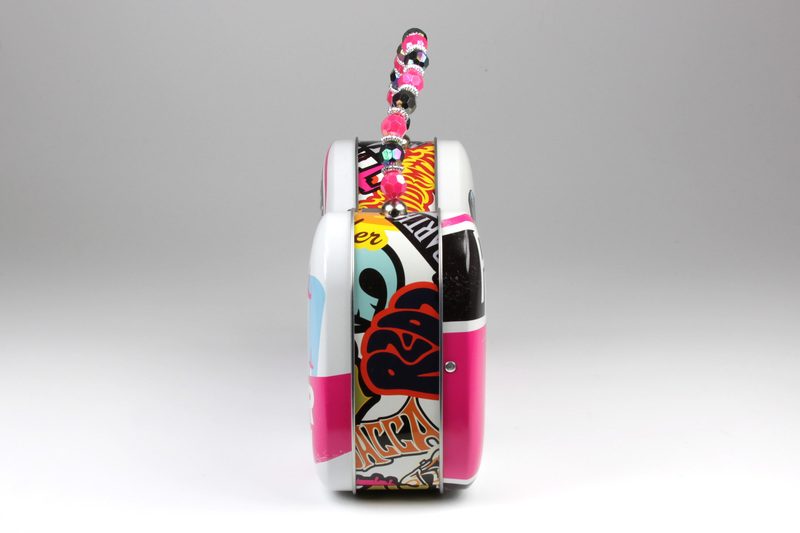 The sides of the purse feature a bright pattern inspired by 70’s era ‘groovy’ text designs. The print includes text like ‘R2-D2,’ ‘Stormtrooper’, ‘Vader’ ‘Chewbacca’, ‘Leia’, and more. This print resembles stickers, overlapped in a scattered fashion – like travel stickers on a suitcase, or concert stickers on a guitar case. Like the front panel design, this scattered print will help disguise any possible scratches much better than if a plain colour panel was used instead. This purse is obviously designed with younger fans in mind – but I was pleasantly surprised at its size. The purse measures approximately 21cm long, 7cm wide, and 12.3cm high (at the widest points). The handle measures approximately 18cm long, with an internal ‘drop’ of 8.5cm. As a reference, I can nearly fit my tri-fold Loungefly Star Wars wallet inside, but not quite. This purse can easily hold a coin purse, phone, makeup, keys etc – making it a cute accessory for a Princess Leia themed convention outfit or for an evening out. 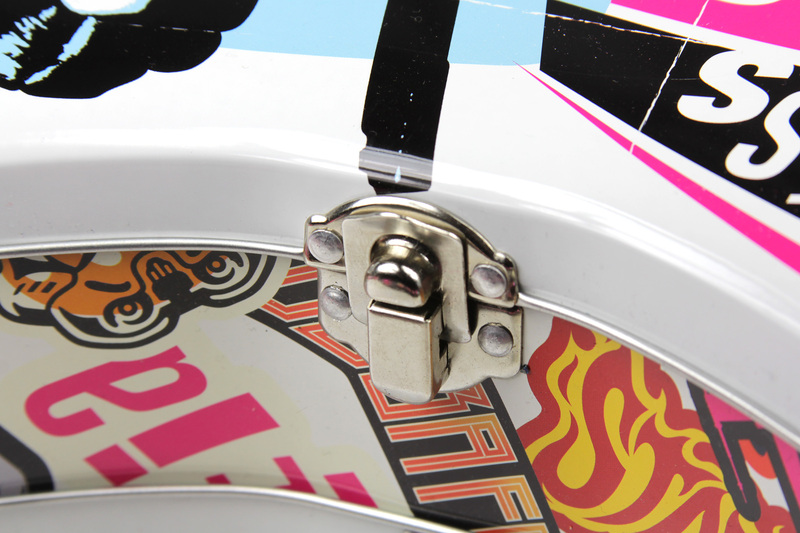 The bottom of the tin purse features two information stickers – the first sticker features the company information and website, while the second sticker includes the Star Wars logo/copyright information and barcode. These stickers are removable, so they don’t detract the from the printed design. 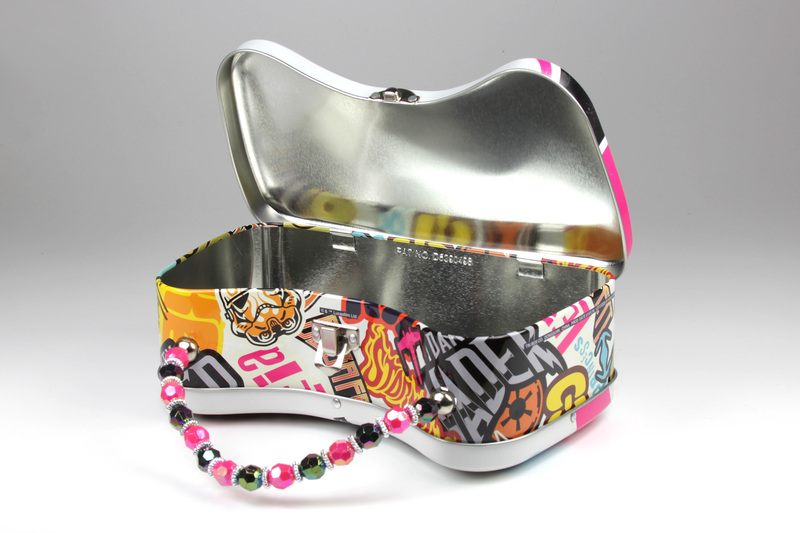 The purse opens with a hinged front panel, with a silver-tone metal clasp on the top edge. This clasp is attached with silver-tone rivets to the metal purse body – the same style rivets are used to secure the metal panels of the purse together (sides, front, and back). The clasp fits securely when closed – the internal mechanism closes the clasp with a snap if you let go when partially open. As this is not a locking clasp, I am happy to see this clasp closes tightly. A moving part like this is of course susceptible to wear with long-term use, but it does feel like it will last quite well. 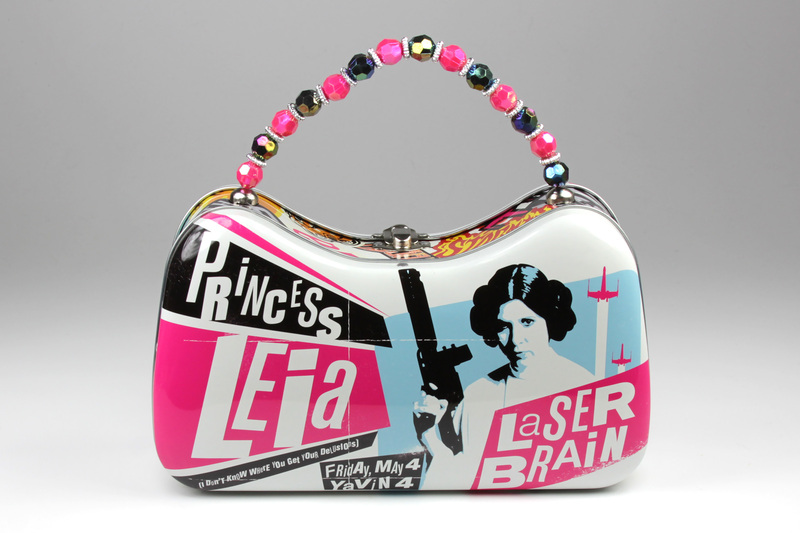 When open, the Lucasfilm copyright information can be seen – it is printed on the purse just under the clasp. This is a nice and subtle placement – I expected to find it printed on the bottom. Considering the other branding/information stickers can be removed, I assumed there would be another place for the copyright stamp (it’s always there, even on the smallest Star Wars jewelry items). The Tin Box Company information is also printed on the outside – just under the rim of the top flap on the side (as seen on the right side in the photo below). This text also includes the country of manufacture (China), production date (1/1/2016), and the lot code. Again, this is hidden when the purse is closed, so it doesn’t detract from the print. The top flap is hinged, and can open up all the way. 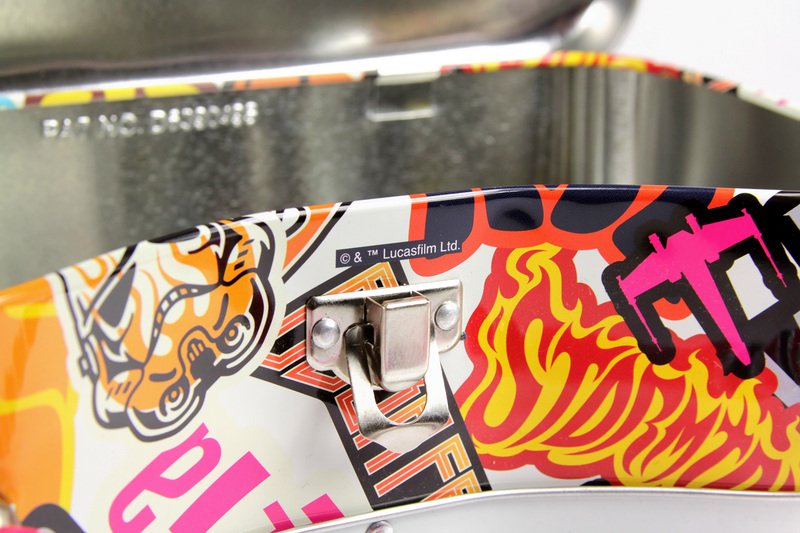 Inside, the interior is bare metal – so you don’t need to worry about car keys etc scratching an internal print. A patent number is stamped on the interior, but this is not visible on the outside of the purse. The edges of the rim are rounded, so the outer print continues just inside the purse. The edge of the top flap is curved the other way (outwards), so the silver metal forms a thin trim. 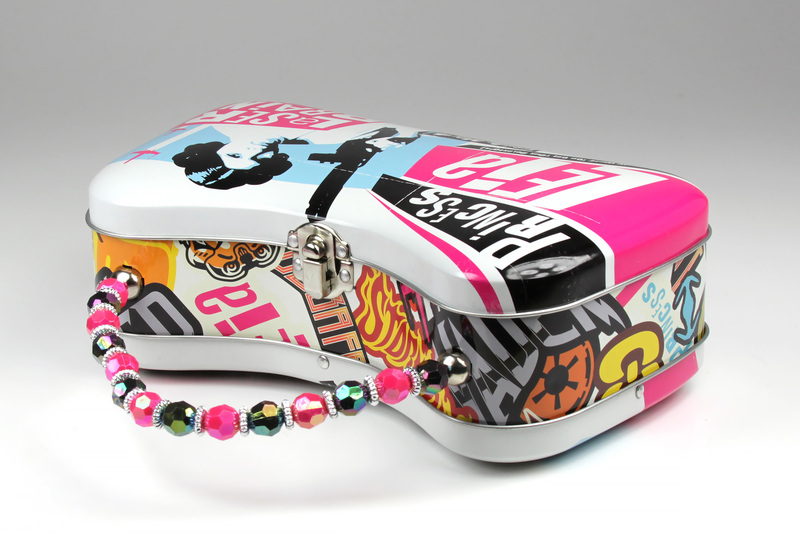 A great option for this purse – use it as a makeup bag! The metal interior is easy to clean from any spilt powders or liquids, and looks great sitting on a shelf or counter. The rigid shape means it always sits up nicely, making it perfect for display alongside collectibles, perfumes, jewelry, or makeup. It makes a great little trinket holder too. While of course this is not an everyday handbag, it is a fun accessory for special occasions. The bright and colourful Princess Leia print is sure to get attention, and I just love the touch of sparkle with the beaded handle. 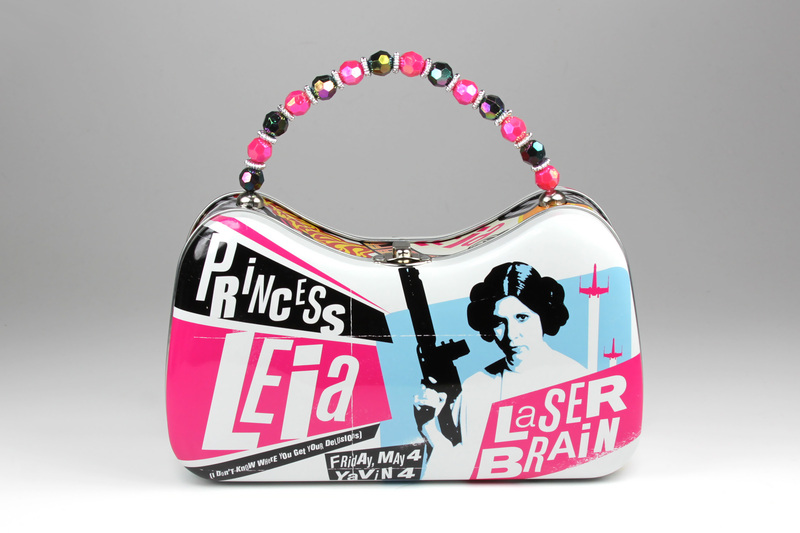 Whether you use it as purse or makeup bag, or just a holder for trinkets and keepsakes, it is a wonderful addition to any Princess Leia collection.